The Sacramento–San Joaquin Delta of California was once a 1,400 square kilometer (km2) tidal marsh, which contained a vast layer of peat ranging up to 15 meters (m) thick (Atwater and Belknap, 1980). Because of its favorable climate and highly fertile peat soils, the majority of the Delta was drained and reclaimed for agriculture during the late 1800s and early 1900s. Drainage of the peat soils changed the conditions in the surface layers of peat from anaerobic (having no free oxygen present) to aerobic (exposed to the atmosphere). This change in conditions greatly increased the decomposition rate of the peat, which consists largely of organic (plant) matter. Thus began the process of land-surface subsidence, which initially was a result of peat shrinkage and compaction, and later largely was a result of oxidation by which organic carbon in the peat essentially vaporized to carbon dioxide (Deverel and others, 1998; Ingebritsen and Ikehara, 1999). 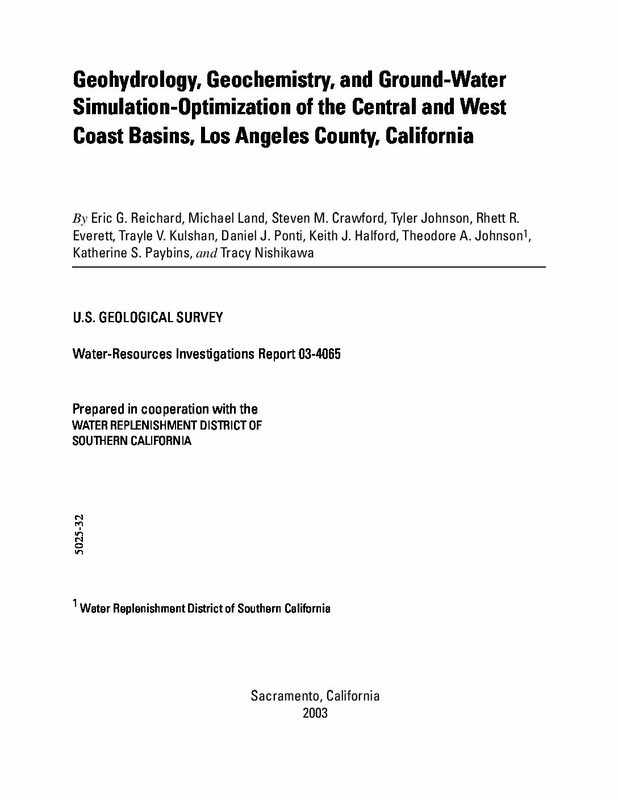 Because of subsidence, the land-surface elevation on farmed islands in the Delta has decreased from a few meters to as much as 8 m below local mean sea level (California Department of Water Resources, 1995; Steve Deverel, Hydrofocus, Inc., written commun., 2007). The USGS, in collaboration with the University of California at Davis, and Hydrofocus Inc. of Davis, California, has been studying the formation of the Delta and the impact of wetland reclamation on the peat column as part of a project called Rates and Evolution of Peat Accretion through Time (REPEAT). 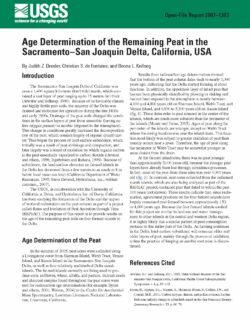 The purpose of this report is to provide results on the age of the remaining peat soils on four farmed islands in the Delta. Protection of ground water for present and future use requires monitoring and understanding of the mechanisms controlling long-term quality of ground water. 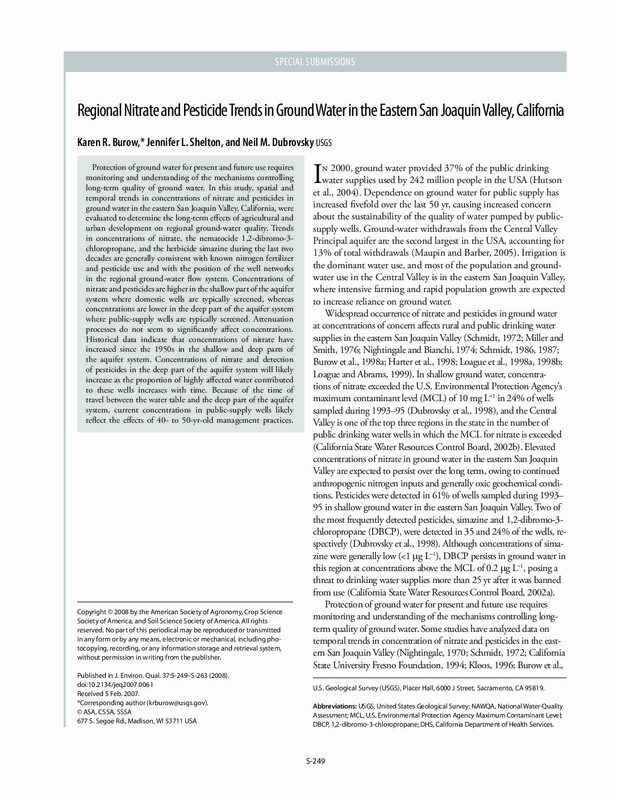 In this study, spatial and temporal trends in concentrations of nitrate and pesticides in ground water in the eastern San Joaquin Valley, California, were evaluated to determine the long-term effects of agricultural and urban development on regional ground-water quality. Trends in concentrations of nitrate, the nematocide 1,2-dibromo-3-chloropropane, and the herbicide simazine during the last two decades are generally consistent with known nitrogen fertilizer and pesticide use and with the position of the well networks in the regional ground-water fl ow system. Concentrations of nitrate and pesticides are higher in the shallow part of the aquifer system where domestic wells are typically screened, whereas concentrations are lower in the deep part of the aquifer system where public-supply wells are typically screened. Attenuation processes do not seem to significantly affect concentrations. Historical data indicate that concentrations of nitrate have increased since the 1950s in the shallow and deep parts of the aquifer system. Concentrations of nitrate and detection of pesticides in the deep part of the aquifer system will likely increase as the proportion of highly affected water contributed to these wells increases with time. Because of the time of travel between the water table and the deep part of the aquifer system, current concentrations in public-supply wells likely reflect the effects of 40- to 50-year-old management practices. Full article available via journal subscription or through ProQuest and public library system.